The IR220L attaches to the RS232 serial port of desktop PC to give the user wireless data transfer for record synchronization, file back-up and network access, directly from IR-capable notebook PCs and PDAs. No external power is needed! 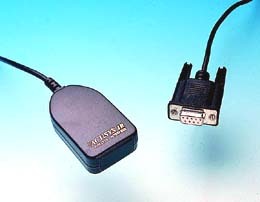 This ACTiSYS adapter has already been built into Windows 95 and many PC link software for IR-capable PDA, H/PC, data terminal and portable medical devices! No additional IR driver installation is needed! An integral 4-ft cable with DB9F connector.